The European awareness of America is based on old concepts and images. America was always seen as an “offspring” (Prisching 2003, S. 3) of Europe, so its perception is not focused on religious and political differences. The mistake within the European opinion is to underestimate the differences between Europe and America concerning the founding myths, the evolution of mentality, the economic and everyday culture and values and beliefs. But America keeps its own traditional attitude towards Europe as well. Besides mutual stereotypes and incongruent images there is a lack of awareness of semantic differences: In both cultures terms like moral good, justice or liberty look like the same but do not mean the same, although this obviously seems to be expected. 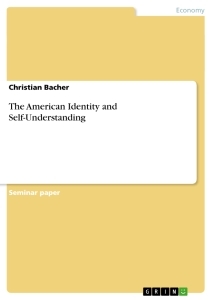 To develop these expectations this paper aims to give a better understanding of the American identity by providing an overview of the background of American values – and answering the question: What is the American self? “AT TIMES it becomes necessary for a nation to defend itself through force of arms. Because war is a grave matter, involving the sacrifice and taking of precious human life, conscience demands that those who would wage the war state clearly the moral reasoning behind their actions, in order to make plain to one another, and to the world community, the principles they are defending. 1. All human beings are born free and equal in dignity and rights. 2. The basic subject of society is the human person, and the legitimate role of government is to protect and help to foster the conditions for human flourishing. 3. Human beings naturally desire to seek the truth about life's purpose and ultimate ends. 4. Freedom of conscience and religious freedom are inviolable rights of the human person. 5. Killing in the name of God is contrary to faith in God and is the greatest betrayal of the universality of religious faith. So what is a ‘just war’ and what do these ‘moral truths’ mean? There seems to be no common understanding between the United States and Germany. The first chapter defines basic terms, which are the prerequisites and tools for this paper, shows distinctness and examples of distinct American values. The second part tries to give insight into the origins, history and evolution – the ‘where … from?’ – of the American identity by portraying the characteristics of selected American values. The last chapter will provide a conclusion on the current development of the American self-understanding and ideas about the future – the ‘where to?’ of the American self. But this ‘identification’ is based on my own – European or German – point of view as a part of the European or German ‘collective mind’, so that the following conclusions are not drawn on an objective selection of facts. This is an abstraction, neither I will not try to provide a complete overview of what I call ‘American values’ nor to discuss the conception of ‘identity’ scientifically but rather try to clear a path to a better understanding of American behavior and mentality. The politic and religious culture of the United States follows for the most part an unchanged and linear development. This partly results from the continuity of the American constitutional rules and stability of the American democracy, of freedom of religious beliefs, which all were not affected by changes of the social system nor religious wars for more than two hundred years now. This unbroken development produces a wide constant spectrum of “common recognized values” (Wasser 1982, S. 23) serving as a normative basis for the American society. But what are ‘values’? They are act-determining rules that lead and limit human behavior, they provide sense of one’s life and direction in the surrounding world. The aggregation of values, which are meaningful for every US-citizen, to a mosaic make the image of the American identity visible – as a stabile self-concept. Identity is described as a concept of continuity which helps to ascribe acts and characteristics to a certain culture or person. In addition it can be seen as a self-concept or an outline of somebody’s life which is of vital significance for him or her (vgl. Düwell 2002 S. 529, 395). The most obvious beliefs and values of the American society are found under the concept and the idea of the American exceptionalism. The ‘founding myth’ marking the beginning of American history is even the source for the most obvious hotchpotch of American values – the so called American dream. The ideal of American society has been a classless society, and when asked, most part of US-citizens still consider themselves to belong to the ‘middle class’. ‘Classless society’ does also include the possibility of individual social advancement. In the ‘country of unlimited opportunities’ individual development and geographic mobility regardless of birth, status or ethnic belonging is at everybody’s reach (vgl. Adams 1999, S. 726). The individualism, the idea of self-responsibility and freedom of a restricted life “was an inevitable consequence of democracy and equality” (Glazer 1987, S. 226). The American consumerism combines individualism, equality and democracy effectively: The individual is enabled to express himself, but also to regard himself as part of a community of equals that all pursue their happiness and – through the paradigm of capitalism – nobody will ever be excluded from “consumer-democracy” (Herzinger 2002, S. 4,5). In America the freedom of individual purposes and unlimited opportunities mean to strive for material and social success as a ‘moral duty’ (vgl. Adams 1999, S. 727). The ‘myth of success’, that the American culture produces is an additional guarantee that one overcomes class limits. Along with that comes a kind of social pressure of showing a positive and optimistic attitude to (work-)life. The reversal of a duty of optimism is then the avoidance of resignation (vgl. Prisching 2003, S. 7) – it means: keep your faith and you will fulfill your dreams through a sense of duty, sincerity, modesty, helpfulness and humor. A second chance, the opportunity of try-again or the possibility to begin a new life is granted within the American self-understanding. The individualized work life also provides a good explanation for the ‘hire and fire’ culture: When the individual tries to fulfill his own needs, social and work relations are easily replaceable, for the employer as well as for the employee. Work is not considered as a lifelong task but a short-term post. This kind of self-understanding does easily explain the American position towards gun possession. Today “coalitions of the willing” (Bush 2002, S. 5) also exists, which face the challenges of today’s military threats. The belief of ‘doing the right’ and fighting for a just and better reality is deeply anchored in American thinking, so far the United States can be considered as a “moralizing Nation” (Prisching 2003, S. 12) with a tendency towards perfectionism. Whatever seems to be the right and true answer in a conflict of interests, the prior question is never one of different arguments, which should be solved in a consensus, it is one of ‘good’ and ‘bad’. Both in the individual and in the collective sphere exists a distinction between ‘the good and the bad’, the ‘coalition’ and the ‘axe of evil’, ‘the ones who are with us’ and ‘the ones who are against us’. This is made and backed up by religious origins. In American perception ‘moral truths’ do exist and are not questioned: As a collective Americans will persist in their striving towards a ‘better world’ or ‘ Garden Eden’. They will do that, because it promises the greatest possible individual freedom, fundamental equality and a reasonable public order (vgl. Wasser 1982, S. 27). The single human being is weak in American self-interpretation and apparently it will fail to live by that moral guidelines sometimes. So if political mistakes are made or economic recessions are endured, the reasons will be human failure or individual incompetence, but the ‘system’ remains right and true. In this paper “America” and “American” are used as a Synonym for “United States” and “US”. This is because the Author refers, among others things, to historical facts long before the United States was established. The question “How are you today?” is just a rhetoric one, people are “fine” and it is a “great day” (vgl. Prisching 2003, S. 6,7). ‘Coalition of the willing’ is an old term which comes from 18th century, when the local sheriff surrounded by young men in typical Midwestern villages was forced to fight bandits and Indians by his own, because military and governmental help was not available in time or at all. So a group of volunteers or ‘willing’ ensured – from the American point of view - their justice and freedom, if needed, with force (vgl. Prisching 2003, S. 18). The American cinema mirrors effectively the real society: The evil in Hollywood movies is always a conspiracy of individuals, in the CIA, NSA, FBI, a contemptible senator or spy, but the ‘system’, as a real embodiment of ‘moral truths’ in paragraphs, administrational rules, upright public servants, always defeats the enemy. Bilingual Education for the Mexican Americans - A Way out of the Vicious Circle?